People nowadays are more health-conscious than they used to be. 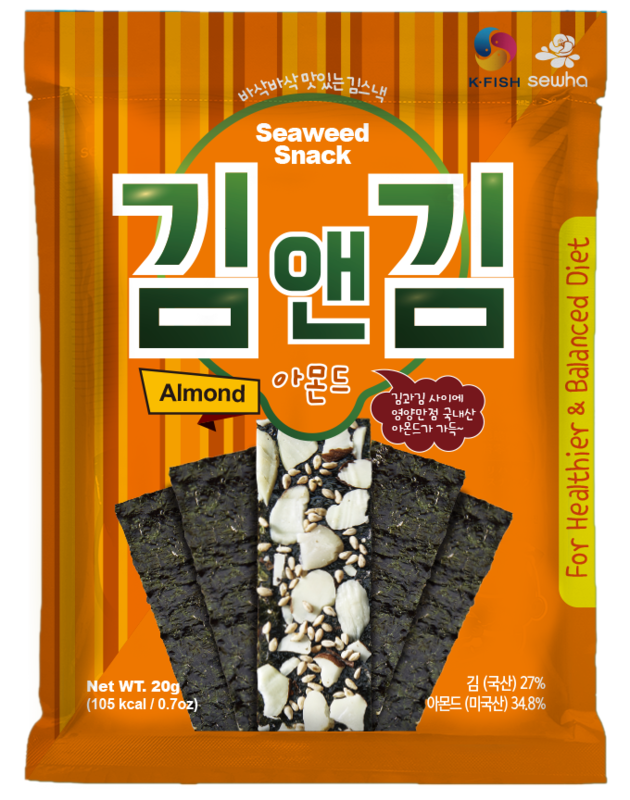 Sewha Seafood is here to globally provide well balanced, healthy and delicious snacks! Healthy snacking is now possible with Gim & Gim Almond Snacks. Unlike fried snacks, our product (Gim & Gim Almond) is a roasted snack made with “Gim”, meaning seaweed in Korean, and rich in minerals, vitamins and proteins and dietary fiber. It is more nutritious than any other snack. In addition, we use the best quality seaweed in Korea, and we are producing snacks in strict quality control environment by fully equipped with world-recognized food management system such as BRC. Our snack is prepared in a very unique way. Between thin sliced seaweed sheets, crunchy nuts and sesame are sandwiched and made into low-calorie snacks. It is a healthy snack of 1pack with a low calorie content with a protein of 5g and a fiber content of 2g. In a hygienic manufacturing environment, we will continue to increase our product line of super snacks using the finest ingredients of seaweed in Korea. We will strive to help keep the world’s diet (snack) environment healthy.